In May of 1935 Mr. Winkler was involved in his first campaign for election, having received the Liberal nomination in the federal riding of Lisgar, defeating the Progressive incumbent, J. L. Brown. Mr. Winkler’s nomination was opposed by officials of the Manitoba Liberal Association, who felt the party would be weakened by the loss of Mr. Brown. The Progressive nominating convention was well attended by serious Progressives, by wily Conservatives willing to go so far as to give a helping hand for that day only, and a number of Liberals who were present for the exact opposite purpose. Finally Ralph Wilson, as chairman, said, “This meeting is packed. We might as well all go home.” That was the end of it. I resumed the campaign. There is an interesting sequel to this attempt to nominate. Almost 20 years later, John C. Davis was elevated to the Senate by Prime Minister St. Laurent. I had always been on the best of terms with Davis. We resumed out intimacy and he often came to my room in the House of Commons after dinner. As I was slated for retirement soon, he became quite confidential. 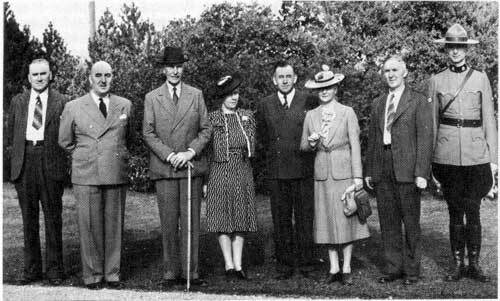 Picture taken at the Experimental Station on the occasion of a visit to Morden in the early 1940s by the Governor-General. Shown left to right are: J. L. Clubine, Mayor of Morden; W. C. Miller, M.L.A. ; Earl of Athlone, Governor-General of Canada; Mrs. W. R. Leslie; H. W. Winkler, M. P. Lesgar; H.R.H. Princess Alice, Countess of Athlone; W. R. Leslie, Superintendent, Experimental Station, Morden; Unidentified R.C.M.P. Officer. The 1935 campaign was strenuous for me. I had plenty of good support scattered throughout the constituency, but the task of welding these together into one organization fell to me, as there was no one with sufficient free time to undertake the work. I thoroughly enjoyed it, but I fear the usual public speaking tasks of a good politician were somewhat neglected. On the eve of the election, when on one occasion the scheduled meeting had to be cancelled, I went home and spent the evening alone, resting and reflecting. I concluded if the election were lost, it had been a profit-able personal experience anyway. Besides my chief opponent, Conservative Miller, the dissidents, of whom there were a considerable number, were persuaded to nominate a person entirely new to politics, Mrs. Mark Nelson of Pilot Mound. One can draw his own conclusions; it may have been pure coincidence that she was the sister of a prominent Conservative, later on an M.L.A., Abe Harrison. She did siphon off a lot of votes which would likely not have voted Conservative anyway. However, my majority was somewhat over 500 which, under the circumstances, was satisfactory. Shortly after the election, in front of the Winnipeg post office, I met Robert C. Brown, son of my predecessor, J. L. Brown of Pilot Mound. Bob congratulated me on the victory in Lisgar, then added he had something to tell me, if I could come up to his office. It proved to be the board room of the United Grain Growers Ltd., which organization more or less cast a fatherly eye over the United Farmers of Manitoba, of which Bob was the secretary and his father the president. (In later years Bob joined the United Grain Growers and rose to be vice-president.) But to return to Bob’s message for me. There were the usual things he thought I should know. Most, to me at least, were inconsequential, but finally he came to it. He had strong backing to seek the nomination in Lisgar, but had deferred while his father clung to the office. He would like to know if, on the occasion of the next federal election, his name came for-ward in competition with mine for the Liberal nomination, what my attitude would be. My reply was that if he should receive the nomination, I would get behind him, just as I had his father. The matter never came up again. Five years later, in 1940, with an improved organization, we emerged from the election with the greatest success of my career. All my three opponents lost their deposits. In our first term of parliamentthat is, 1935-40which was a first for most of us from Manitoba, the relationship between the majority, but not all the federal Liberal members of Manitoba, with John Bracken and his government, had not been good. We had found that it was accepted by the Brackenites that we would pile in and help with their elections, but it was apparent they shrank from returning the favour. The obvious reason was that they did not wish to offend their Conservative friends and supporters. Possibly from the angle of Mr. Crerar and the Winnipeg Free Press, that was looked upon as good politics, but as a member who had Conservative M.L.A.s in his back yard at home, I was disappointed, as were others. Early in the next parliament I had a caller in the person of Stan McRae, a well known footballer of former college days. He had been sent on a mission to get a verbal report on the member’s relationship with John Bracken and his following. My report would be treated as confidential, for the Liberal headquarters only and I was invited to be open about my views. That McRae was honest and sincere I had no doubt, so I gave him a full account, chapter and verse. He called on all the Manitoba Liberal members in the same manner. Within a few weeks I was startled to receive a two-page letter signed “John Bracken” which began with, “I understand that you have expressed views about me and my association in an unfavorable way.” I checked with other members who, I knew, shared my views, and they had all received a similar letter, which convinced me that Mr. Bracken had some good connection with the Liberal hierarchy. Meanwhile, Canada was at war. After Pearl Harbor, the general outlook appeared brighter, but the nation continued to tighten its belt, as was right and proper. This put a serious obstacle in the way of my work as organizer, since gasoline and tires, among other things, were rationed. That did not seriously hamper the city constituencies, but in a rural area, it could be misinterpreted as neglect. Then the Hong Kong episode reverberated through the House of Commons and the country, and the casualties touched the homes of a large number of the constituents in Lisgar. John Bracken, a power in the Progressive movement, was persuaded by the Right Honorable Arthur Meighen to become the leader of the Conservative party, and accepted on the condition that the word “Progressive” precede the word “Conservative” in the title. Quite a few former Liberals were prepared to follow John Bracken anywhere. 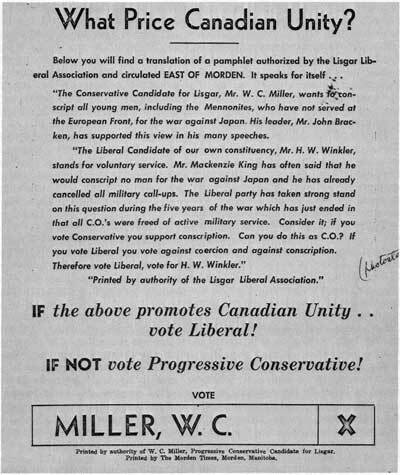 Thereupon Manitoba Conservatives became very enthusiastic over the prospects and W. C. Miller, M.L.A. by now official Conservative organizer for the province, was again chosen as the Conservative candidate in Lisgar’s forthcoming election. For my part, as member of the War Expenditure Committee of the House of Commons, a good portion of the recess was spent in the sessions of the committee touring the country in search of information. All this added up to ominous difficulties ahead. On top of this, Major (Rev.) Edgar J. Bailey with the Canadian Armed Forces in Italy, was persuaded by his college friend, Tommy Douglas, to come home and contest the constituency for the CCF. Bailey was a spell-binder, and directed his attack against the government. He certainly skimmed off a large number of votes, but most of these were skillfully salvaged by Mr. Miller. I barely won with a small majority, while the astonished Major Bailey lost his deposit. The conference in the office of the Minister was fully reported in both daily papers. Mr. Miller read the letterthat is, the translation into English to those assembled, and then held the accusing letter aloft. With a show of horror, he announced that the letter was in the German language. “I certainly would,” Mr. Dryden is reported to have answered. Having thus delivered a verbal black eye to which I could not reply, the matter was dropped. I may add that had anything been done by me or on my behalf which contravened the Elections Act, I feel sure I would have been in court in some capacity. It should also be added that Canada was still at war with Germany. For those who do not know, Mr. Miller was an accomplished linguist. On many occasions he addressed political meetings in the German language, in which he had the advantage over mc. Speech-making in German was far beyond my limited capacity, and I quite envied Mr. Miller’s facility. The good relations between Mr. Miller and the Garson government persisted, and soon it became coalitionist, with Mr. Miller as provincial secretary. Later he was to become minister of education, and speaker of the assembly. Also he won the crown awarded by Miss Salome Halldorson, M.L.A., as the best-looking man in the legislature. But as the poet says, “Uneasy lies the head that wears the crown.” Enter Mr. Miller’s Nemesis, in the person of the Hon. George A. Drew, leader of the federal Conservative party in 1950. He called a meeting of the Manitoba party stalwarts in Brandon. There he announced that the Conservatives in the Manitoba government were to resign from it forthwith. Having received the official Conservative nomination, the next move was by Premier Campbell. He called on S. H. Sobering, the president of the Rhineland Liberal Association and informed him that because Mr. Miller had been giving “us Liberals” such good support, he (Miller) should receive a Liberal nomination. The worried Mr. Sobering could not find it in his power but to comply, so he called a Liberal nominating convention. This was attended by well-primed Liberals and by the grateful Mr. Miller, who was accordingly duly nominated. Thereby he achieved a distinction which is very rare, if it ever has been duplicated. To receive both the official Conservative nomination and the official Liberal nomination in the same constituency in the same year is a feat by any standard. Going back to 1949, I found myself nominated again. My principal opponent was D. Hoeppner of Lowe Farm. He had a good record as a municipal reeve and had always been an ardent Conservative. Fortunately for me, things went well in the campaign, although I discovered that I was tiring too easily. Plagued with bronchitis, which my medical advisors claimed arose from another cause, I was advised to take a year or two off. Such things are unthinkable for a politician, so I prepared to resign and at a meeting in Somerset in 1952, I informed the delegates I would not be a candidate again. However, I added I would like to continue my relations with the organization. With my declining physical energies, I made certain of one thingthe organization within the constituency was in top working form. I felt sure anyone nominated by the Liberal convention would be successful. That proved to be the case. After the election, in which Mr. St. Laurent’s government made a strong showing, I felt like sending some letters of congratulation, of course. One was to the Prime Minister. Lisgar had remained in the Liberal column, while at least two other Manitoba seats, where the Liberal majority had been much higher over the years, had been lost. In a footnote to my letter, I pointed out that Lisgar had remained loyal. I received the reply”The victory in Lisgar is due to GOOD GOVERNMENT.” (The capital letters were his.) Over the years, I had given myself (without ostentation, I hope) a measure of credit for having kept Lisgar in the Liberal column.